Kai Salon and Spa is a trendy Aveda salon and spa with locations in Minneapolis and Champlin Minnesota. 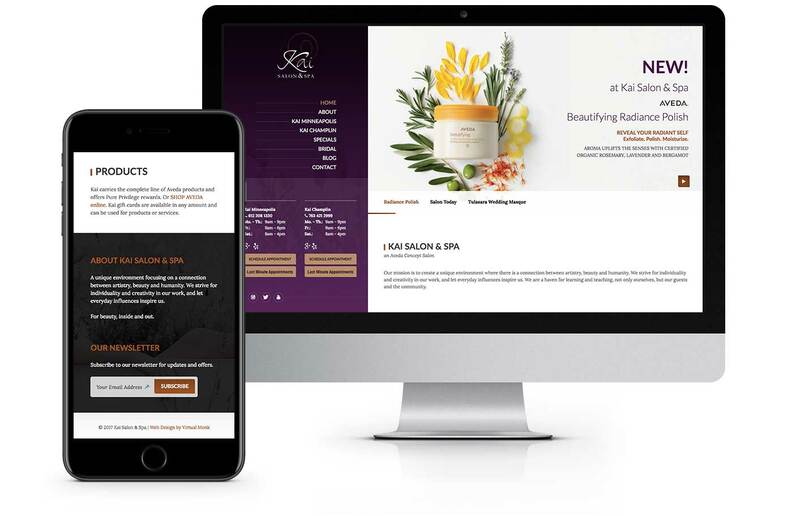 Minneapolis web designers, Virtual Monk, designed a beautiful website that reflects the company’s style, and which focuses on “beauty inside and out.” kaisalon.com features tons of interactivity, subtle animations, and incredibly responsive layouts optimized for many desktop and mobile browser sizes. Excellent organic SEO was added to this site bringing Kai to the front page of Google for their chosen keywords.